I just finished watching the fifth season of mad men, great show. I can’t say why since all we see is these ad men going about their lives. But somehow it draws me completely in, it’s so addictive and leaves me wishing for that other life, and let’s be honest the life of a rich white man in 60’s America is something worth aspiring to. While it may be short while it lusts it lasts. Drinking in the office is always fun and they have their whiskies ready by 2 in the afternoon; every meeting is capped off by pouring some alcohol in a glass, reaching for the bottle as instinctive as offering a seat and everyone does it so it’s not alcoholism. Plus the different situations when people smoke never fails to shock; in the elevator, holding a baby, in the doctor’s office. That time period is so glamourized and really what man wouldn’t want to be Don Draper or Roger Sterling? They pour charm out as quickly as they take in liquor never stopping to worry about consequences and like all the men who have everything they are not sure why they are still unhappy. Adding trophy after trophy, reaching for a satisfaction that is always out of reach. At one point Don says “and what is happiness? Just a moment before you need more happiness.” So apart from that measly morsel of malaise who wouldn't want to be a mad man? When I was done with the season I went on an internet binge, it’s really quite frustrating to have watched something and not be able to talk about it. Humans are social animals and the worth of an experience is always enhanced by those you can share it with. It’s why when you read a good book you recommend it, why you push a good movie, you want someone else to feel how you felt so that you can reminisce. Remember when? is one of our favourite games. The thing about the internet is that there is such a vast variety of opinions on all the things we love and hate. There are people who experienced it differently, saw things you didn’t and can put together pieces of the puzzle that you never even took out of the box. 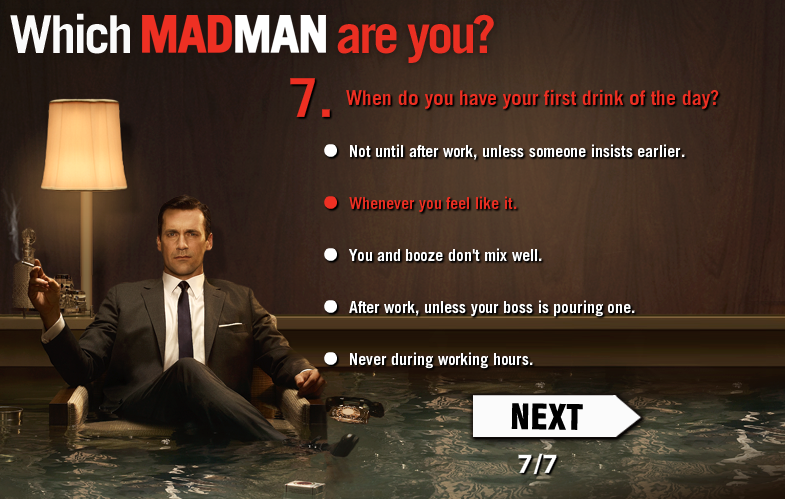 In my search for information I came across one of those quizzes “what mad man are you?" I took the quiz and answered the questions as honestly as I could and it turned out I am most similar in temperament and personality to Roger Sterling. He’s my favourite. He drinks a lot, he smokes a lot, he scores a lot, he’s an aspiring writer and he’s so much funnier than Don. At the other end of the spectrum he’s not happy with any of the women he’s with. He doesn’t like his current wife and lets her know it and there is a woman who’s perfect for him every time I see Roger and Joan together the little girl in me prays for them to hook up can’t they see how perfect for each other they are? Also he drinks too much, he smokes too much and spends a lot more time reacting to situations than predicting them and acting. Life happens to him and all he does is stay on the boat. But if I could be anyone it would be this guy. While I answered the questions on the quiz my mind kept telling me that no one does these things completely honestly. As soon as I started I knew I wanted to be Roger, I knew I liked him and he’s the one I would most like to drink with. My answers were less honest and more aspirational. It wasn’t the me I actually am but the one I wanted to be or the one I wanted people to see me as. . Isn’t this the main problem with personality tests and quizzes sometimes we choose the answer most in line with the idealised picture of ourselves in the mirror. We overcompensate without knowing it; no man ever admits that it actually does happen to all of us without making it sound like a joke, only NASA is allowed to take failed shuttle launches seriously. Sometime last week a conductor gave me a really crappy 50 shilling note, it was torn and old. It looked ragged and dirty as if someone had mopped up tears with it and then thrown it away in shame for making such a scene. On a matatu I tried to pay with it, this guy refused, he turned me down and all the passengers were on his side. I opened up my palms and told him all I had was this and 15 shillings, the fare was 20 and he agreed this was when i got an inkling that it was a special note. A part of me remembered that you can go into a bank and ask them for a replacement note, so walked into Stanchart. I waited patiently on the line; it was one of my dressy days. I had run a comb through my tangle of hair meaning I left a thick mat of it in the bathroom. I was in a tie and a half coat, I looked sharp, I felt smooth and when it was my turn I walked up to the bank teller’s window and proudly took out the note and told the lady my woes. Apparently and this is important information for all of you out there, you can only get these exchanges done at a central bank. I put on my pained expression and asked her if she was sure, she said she was. I ran a hand through my hair (this has forever been my come hither look am not sure if it works but I feel like it gives me a certain boyishness) this time I did it to show off some recently acquired scars on my face. I was appealing to her sympathy for the boy who had been robbed or had fallen or whatever it was flashed through her mind at the moment. I’ll admit it felt strange seeing her reach into the pile of notes she kept nearby and take out a crisp new 50 bob. I’ll admit it was a strange sensation when he turned down my 50 and passed the crisp, new one to me. This was not the result I had expected and getting it was surprising to say the least. I thought about refusing but then my love of a good story was much stronger than my pride. I tucked the note in my pocket and walked out of stanchart having effected my first bank robbery. Tell me, isn’t that a coup worthy of Roger Sterling? But child, you need to get a less complicated comments mechanism. This is worse than the last one!